Each day your employees give their physical, emotional and mental energy so your company can achieve its goals. In return, as employers, you provide financial compensation. However, does that really feel like enough? Here are my top 10 Employee Appreciation Day ideas to show you care. What does your employee or team like to do? Figure that out and then do that together. That’s putting their desires and happiness first. It goes a long way to show they are important to you. Case in point; Brennan, my boss, indulging me at a conference by getting a photo with the Coca-Cola bear mascot. I am very happy. Can you tell? Birthdays and work anniversaries are tablestake milestones to recognize. 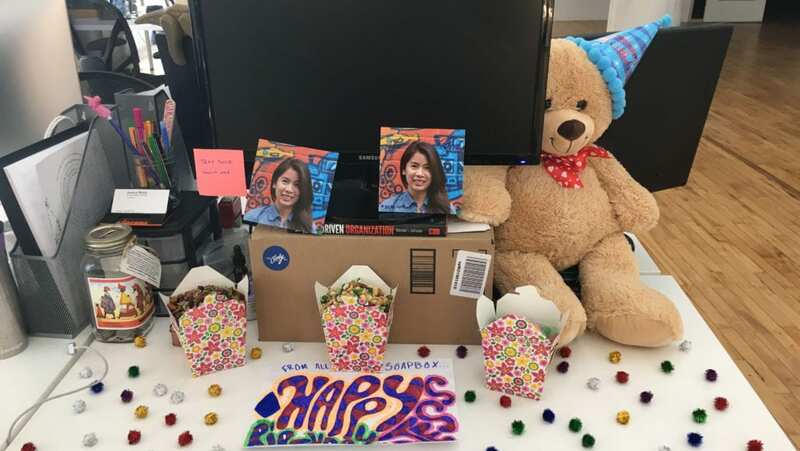 Birthday celebrations (like decorating the birthday person’s desk) inject fun and festivity into the normal routine. It’s also a way to say that you’re glad they came in this world, however many years ago. Work anniversaries are a great time to acknowledge a person’s contributions and strengths. At SoapBox, we ask the whole company to contribute by giving feedback on the person before their work anniversary. Then on the day of, we have the individual’s manager read off all of the things the company admires and is grateful for from that person. Work anniversary celebrations cement the value and importance of that person being part of your organization. Changing up the environment brings a team together and deepens relationships. A huge reason many of us get up and go to work each day is because of the folks we get to surround ourselves with. Doing an event with your team (like pottery making) shows your employees their presence matters and you want them to enjoy the time you spend together. Once a year, the SoapBox retreat is our time to unwind with limited discussion of work. This is no boondoggle: a work or activity that is wasteful or pointless but gives the appearance of value. Our company offsite is valuable for the business because it is rejuvenating for employees. Our employees work hard. They sacrifice their own personal pleasure to create results for our organization. In return, we give back some of that personal pleasure time with a special vacation. In change management, a big part of successfully going from point A (your current state) to Point B (your ultimate goal), is to celebrate the small wins in between. Taking time out of the day for your employee to be recognized for accomplishing something important shows you’re making progress and reminds them they are awesome. We’re a big fan of the gong (yes, we literally bang a gong) and getting the employee to celebrate their own success. Take the old mantra, “The way to someone’s heart is through their stomach” and apply it to your manager-employee relationship. Who doesn’t love a lunch out, a treat that shows up on your desk or an afternoon pick-me-up brought to your meeting? There are some great companies, like Platterz, who are making it even easier for managers to say “thank you” with food. Be bold and say what you appreciate about your employee directly. This can be done formally, by sharing it in a Town Hall or by writing a note on company letterhead. Or, let them know how you feel, right when you feel it via a text or Slack message. This is the simplest, cheapest and likely the most effective way to let your employee you’re grateful. If you appreciate your employee, then you appreciate all of who they are. As one person on my team has told me, the biggest thing she got from being at SoapBox was feeling accepted for who she is. Each and every day your employees should have the space to be their true selves, with all their quirks, interests and uniqueness. At work, most of what employees do is based on what the manager or company needs done. Ideally, this draws out the unique skills of your employee but sometimes leaves talents hidden away. 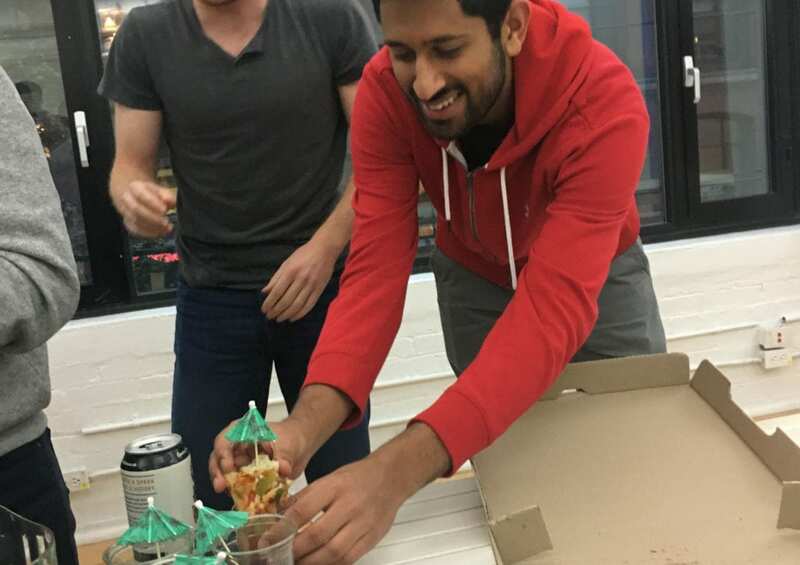 Creating a time and place for your employee to use the skills that they enjoy will energize them the work they do and can bring an extra boost to your goals too (or not, as evidenced in the photo of some of our employees utilizing their creative skills to embellish a cocktail with pizza). Instead of just covering what needs to get done or constructive feedback in your one-on-ones, let your employee know if they have done something specifically well and why. I find this extra meaningful in areas I know my employee is working on or trying to improve. Positive encouragement should come not just in annual reviews. It needs to come weekly on the specific things they are working on. 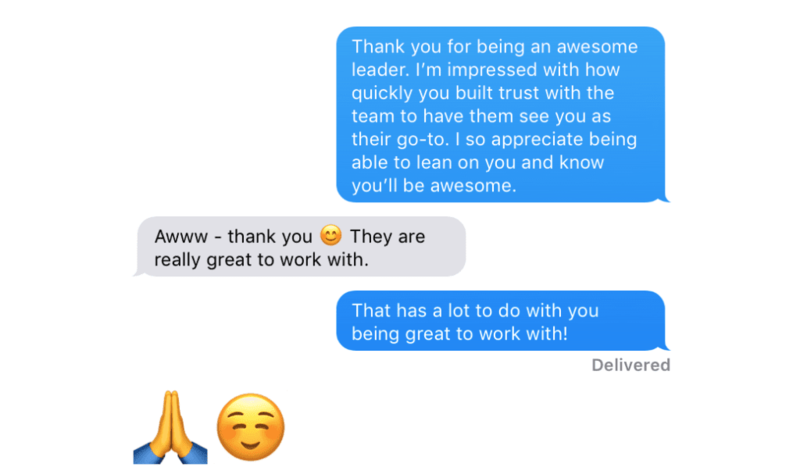 That’s a one reason why we built SoapBox’s one-on-one feature so that managers had a place to say what they appreciate in their employee.